It’s understandable that you don’t want to spend any more money, but it’s absolutely appropriate to think of pre-sale preparation as an investment that will help you to get your home sold faster and, in all likelihood, for a higher price. This is a very competitive market. Buyers WILL notice and make decisions based on the condition of your home. Little details like a poor paint jobs, dirty woodwork or hairline cracks on the wall can hint that this home is poorly maintained. More importantly, buyers want turn-key homes. Think about the difference between a crumpled, slightly grimy dollar bill and a crisp bill fresh from the bank. They’re both have the same value, but which one are you drawn to? As a general rule, you can make your feel fresh and move-in ready by investing in these simple and inexpensive fixes that will make your home sparkle. But to start, it’s imperative to take a step back. 1. Disassociate Yourself From Your Home. …De-Clutter!We humans tend to collect an amazing quantity of junk. Consider this: if you haven’t used it in over a year, you probably don’t need it. And if that doesn’t convince you, the average return on investment for de-cluttering and organizing is 973 percent. 3. Rent a Storage Unit and Remove Favorite Items. 4. Make Minor Repairs and Clean, clean, clean! The average return on investment for lightening and brightening–865 percent! Staging is a great investment for sellers who are looking to sell quicker and for more. NAR’s (National Association of Realtors) new statistics said that now 89% of buyers shop online first before actually seeing a home. A staged home photographs better than a vacant one or a non-staged, lived-in home because it’s more edited and styled professionally to appeal to a broader range of buyers and to showcase the pluses and spatial relations of the listings through the photograph. So staging will help to move buyers to the open houses and increase foot traffic. A staged home also sells faster in any market, no matter hot or cold. The housing market is competitive. As a seller, you should invest on things that can help to sell your home quicker and that can compete with other listings on the market. Staging is really a marketing tool and a sound investment. You want to be the listing that everyone wants to buy, not the one everyone is using as the comp to sell the other house. Additionally, styling the home will help to add visual interests and invoke emotions that will trigger buyers to make an offer. Buying a home is an emotional process and you want to appeal to those emotions as well. There is a visual example that I often use with clients. 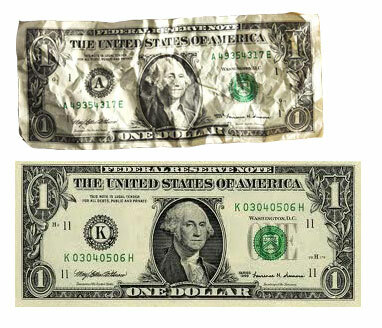 Picture a crisp and clean $1 bill and then picture a wrinkle, dirty $1 bill. Now, both $1 are worth exactly the same, but which one would you rather have? The crisp, clean $1 bill, right? The same goes with your listing. House A and House B may worth exactly the same, but most people choose the staged House B over A because it’s presented well, shows well and is much more appealing. Staging’s average return on investment is 251 percent. And when you’re staging, don’t forget to Check the Curb Appeal. If the idea of spending money prior to sale still feels uncomfortable, try thinking of it this way. The money you invest upfront to spruce up and stage your home will almost invariably be less than the first price reduction you make when it doesn’t sell in a timely fashion. A home without a buyer has no value in the market place. Sure it might have a value to you the seller, and it might have a value to your banker, and to your insurance agent, and to your appraiser. But none of these people are buyers. So here is the secret to pricing your home to sell – It’s not what you think the home is worth that matters, it’s what a reasonable buyer will think your home is worth that will ultimately determine if your home will sell. The trap many sellers fall into is the mistaken idea that they can hold out for an inflated price and eventually the market will come to them. Wrong! Buyers are under no obligation to buy any particular home, and no amount of marketing, open houses, websites, or signage will motivate a buyer to purchase an overpriced home. Why? Because they can buy one of your neighbors homes for less! This reveals one of the most important considerations in pricing your home – Price VS Time. A seller who would like to sell for top dollar should be prepared to potentially wait longer for a buyer willing to pay a premium price. Like trying to sell ice during December, a seller might have to give the stuff away just to get rid of it, but if they wait long enough, say until mid-August when temperatures crest over 100 degrees suddenly that same ice can have real value. On the flip side, a seller who needs to sell quickly, and doesn’t have time to wait, should expect to discount their price somewhat because of the limited time they have to expose their home to the market. Buyers are in the same boat. A buyer who has the luxury of shopping for a home over a long period of time can probably wait to find a bargain, while another buyer who must buy a home in the next few weeks will probably be willing to pay a premium. Again it boils down to price vs time. So as a seller, you might ask yourself what is your highest priority – Selling quickly or selling for a higher price? Remembering, of course, that there’s no guarantee that you’ll ever receive an offer at the higher price. Successful sellers have learned that to price their home accurately means they need to think like a buyer, they need to get inside a buyers skin and look at the world through a buyers eyes. For instance, imagine for a minute that you are moving to another area of the country, to a city that you are completely unfamiliar with. If you were faced with buying a home in strange city what would be your first step? If you’re like most buyers, you’ start looking online to get a feel for the market. With the data available today, that means not only looking at list prices, but easily being able to find recent sales, a much better gauge of real market value. Then you’d start looking at houses with your agent and over the course of a few weeks, you become so knowledgeable about the market that by the last showing you are able to guess, with reasonable accuracy, each homes listing price before your agent can even tell you. So what happened here? As a buyer, you went from a blank slate, with no impression of the market to having the ability to predict listing prices. The buyers looking at your home are SMARTER THAN YOU THINK. Price your home right, don’t chase the market, and get ready to call your movers! Download the Six Sure Steps to Sold PDF version of this document.